The IS first debuted in 1998 as an answer to BMW’s formidable 3-series. It was good. But back then, BMW was making cars that were great. Fast forward to today and things have changed a bit from BMW’s end. The 3-series, while technically still considered a compact, doesn’t have very compact-like dimensions. The current version on sale is the largest 3-series ever made. On top of that, it’s toned down. Softer. Floatier. BMW thinks this will give it broader appeal. The 3-series has a good reputation and everyone knows it, so everyone wants one, but they don’t necessarily want one for the reasons that makes it so good: performance. So BMW is in the undesirable position of trying to please everyone’s tastes and now the spirit of the original 3-series is in jeopardy. The IS has gone through a similar transformation but not nearly to the same extent. 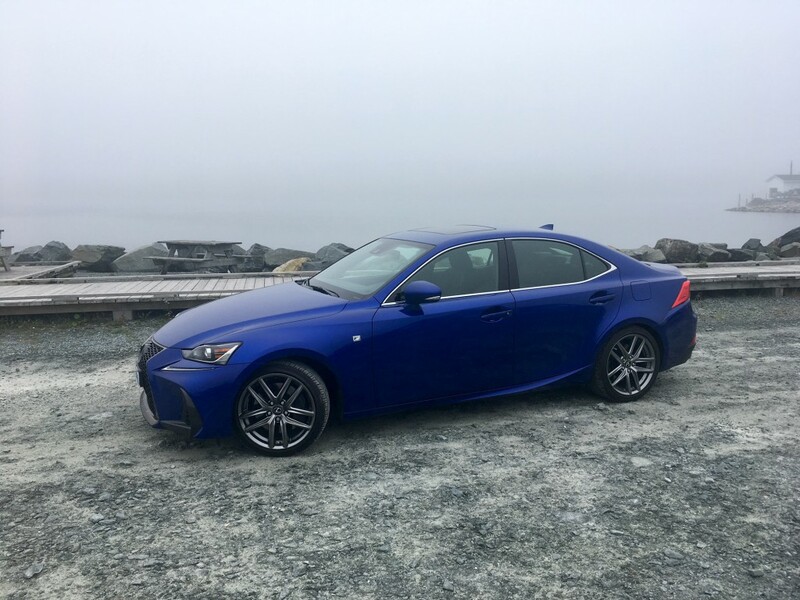 While bigger than the original, it still holds proper compact sport sedan dimensions. The IS also looks sporty too. 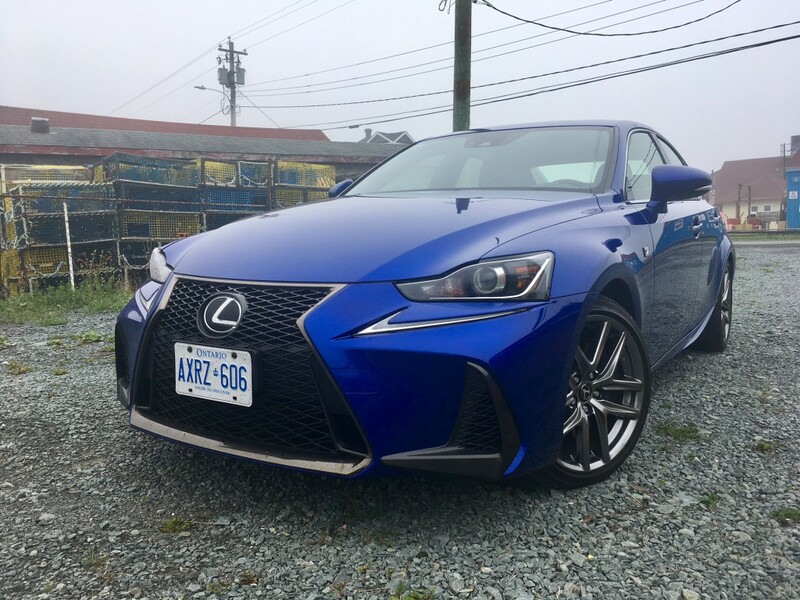 With a mild refresh for 2017, the IS in F-Sport guise and my tester’s Ultra Sonic Blue Mica paint certainly caught the attention of passersby. Reworked headlights and tail lights help to differentiate it from years previous and the curvaceous lines add distinct character. While it is a bit too flashy for my liking, there is no doubt that Lexus has one of the more interesting designs in the segment today. Those compact dimensions make for a rather compact interior, however. Even just getting in and out of the IS can be a bit of a challenge. The door frame opening is smaller than it looks, so you’ll often find yourself hitting your hip against it, or hitting your gut against the steering wheel. While I will admit that I could stand to lose 10 or so pounds, I am by no means anywhere near a generously sized individual. But once you’re in you’ll be greeted with typical Lexus interior design. That is to say, everything is top quality – if a bit dark looking. There is no wood to be found; sportiness is the name of the game in here. The dash can seem overwhelming at first but it takes only a few moments to get used to it. The large infotainment screen can be a bit difficult to see depending on how low you adjust the drivers seat as it sinks into the dash, unlike being tacked on like a lot of its German competition. It is operated by a mouse-like device. It isn’t the easiest way to access all the menus and sub menus, but it still does the trick and rarely do you have to ask it to do what you want more than once. 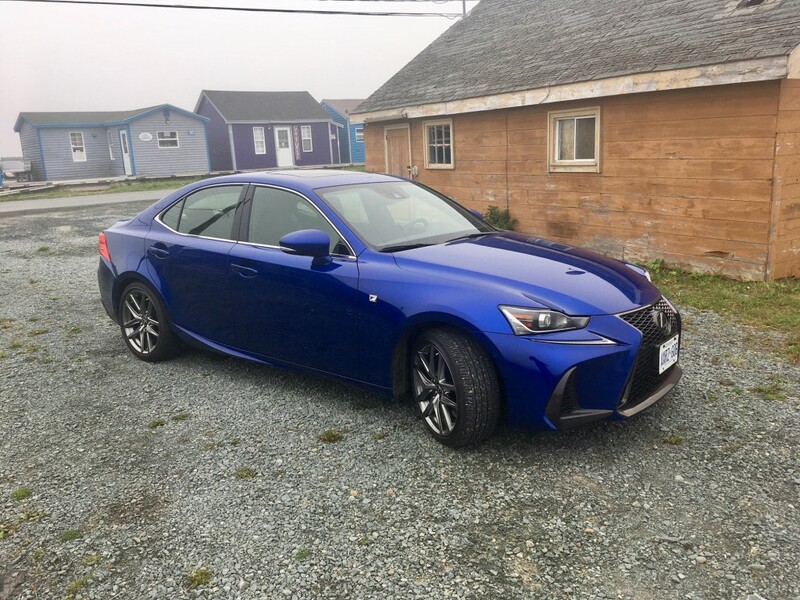 The IS can be optioned out with an array of goodies including a heated steering wheel, an automatic rear windshield shade and ventilated (cooled) seats. The latter was much appreciated on hot days as the black leather certainly attracted the sun’s rays. Rear seating is perfectly fine for children, perhaps teenagers, but adults would likely find long trips to be trying back there. There’s a decent amount of cargo room though – 13.8 cubic feat to be exact with the ability to fold the rear seats if need be. Under the hood is a pleasant surprise for the segment: a V6! Most of the competition have downsized to four cylinder turbos and while the amount of power extracted from turbo fours these days is impressive, there’s nothing quite like knowing you’ve got six cylinders to play with. This particular version of the 3.5 litre V6 is good for 306 horsepower and 277 pound feet of torque mated to a six speed automatic. 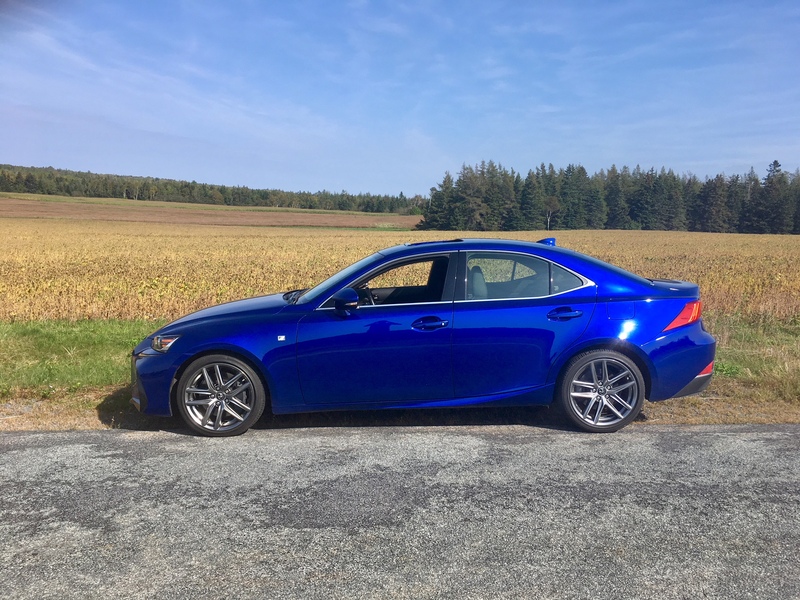 You can get the same engine detuned in the form of the IS 300 which makes 255 horses, but aside from a cheaper price, you don’t get any advantage in terms of fuel consumption. 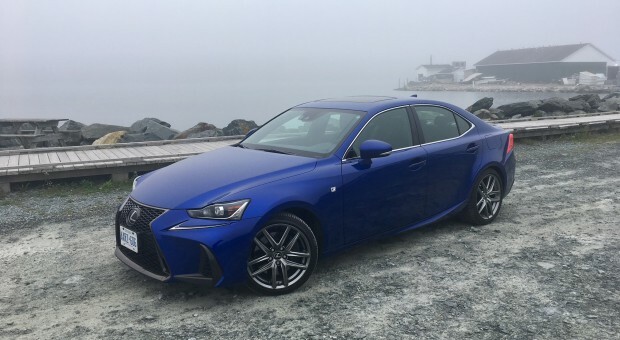 The detuned engine is rated exactly the same as the IS 350. There’s also a 2.0 litre turbo which nets 241 horses along with an eight-speed automatic. But the higher powered V6 is the engine you’ll want. Not only does it emit a fairly decent sound, but it is buttery smooth in its operation and it gets along with the transmission fairly well. Gear shifts could be a lot quicker and responsive, but that only becomes noticeable if you drive the IS like you stole it. Otherwise the transmission is happy to shift casually at just the right moments when you are out for a leisurely drive. There are four driving modes to choose from (Eco, Normal, Sport and Sport+) all accessible rather easily at the twice of a dial located below the gear shift. It’s easy to use and you can access it quickly without having to look down too. With that said, the difference between the driving modes isn’t staggering. Eco makes the car feel neutered and there is little discernible difference between Sport and Sport+. I honestly just kept it in Normal mode for the majority of the time. If you do, you’ll find the IS to be an easy car to live with day to day. Despite power reaching beyond 300 horses, the IS doesn’t feel blisteringly quick off the line. That isn’t to say it’s slow by any means, it just doesn’t seem to take off with any sense of urgency. That may be due to the fact that power chimes in at the upper end of the rev range. Low end torque is not the IS’s forte. But once it gets up and running, there is no disappointment for power. While not the sharpest handling car I’ve driven this year, the IS can certainly hold its own in the bends. I have yet to try the new 3-series (BMW Canada refuses to send press cars to Atlantic Canada for some reason) but I have a hunch that the IS can now out handle the 3-series, or at the very least, match it. Sport+ is where its handling abilities become more apparent. With that said, the sharpness of the IS’s handling abilities could be improved and it does at times feel a bit heavy when thrown into a corner aggressively. But for every day driving that includes a jolt of spiritedness every now and then, the IS certainly serves its purpose. 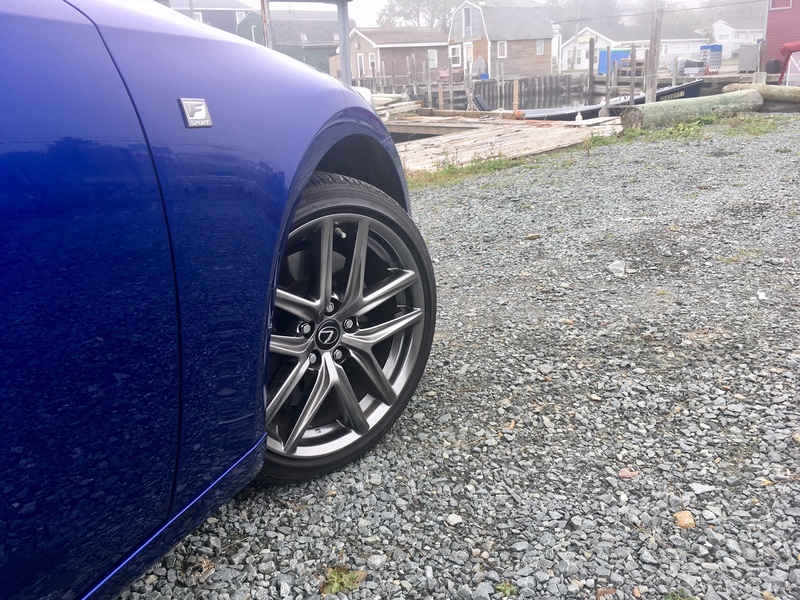 And despite riding on low profile tires wrapped around the 18-inch wheels, the IS rarely feels jarring over bumps and potholes. 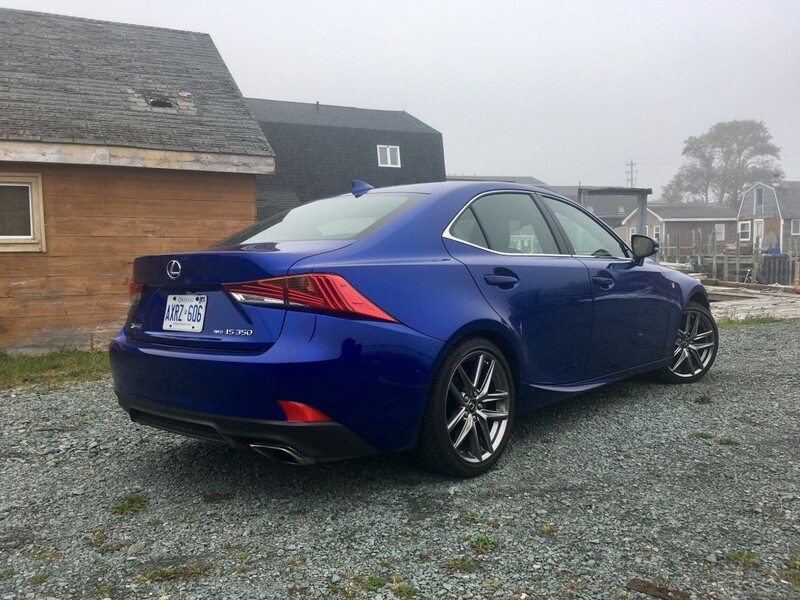 People don’t usually buy sport sedans for their fuel sipping abilities and the IS doesn’t promise to be on par with a Prius either. Still, the 12.1 L/100 kms I returned after a full week of mixed driving isn’t terrible. Official numbers come in at 12.6 city and 9.2 highway. As mentioned, I haven’t driven the new 3-series yet and it sounds like the only way I’ll be able to is to visit my local dealer. So it’s difficult to say if the IS has really achieved its end goal of outshining the 3-series. 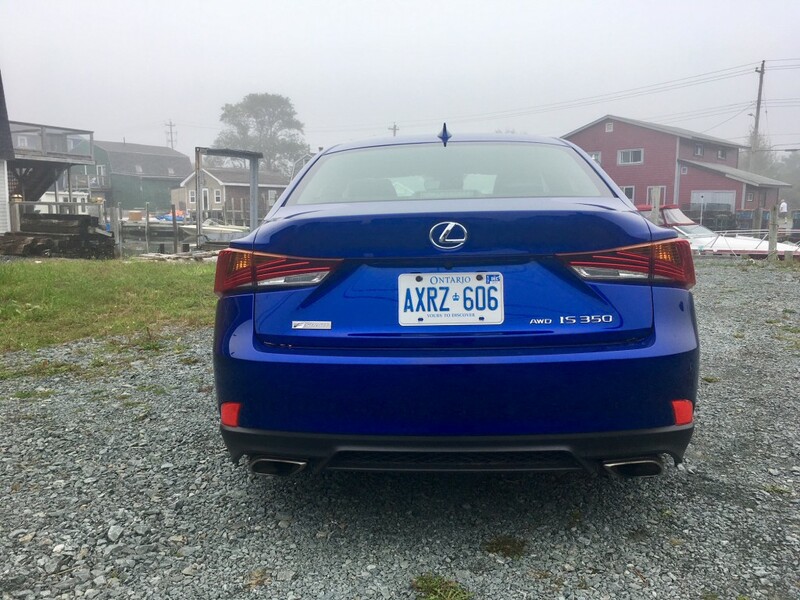 It appears BMW still sells more 3-series’ than Lexus does IS’s but sales don’t necessarily determine whether a vehicle is actually good or not. And the fact of the matter is, the IS is a good car, full stop. 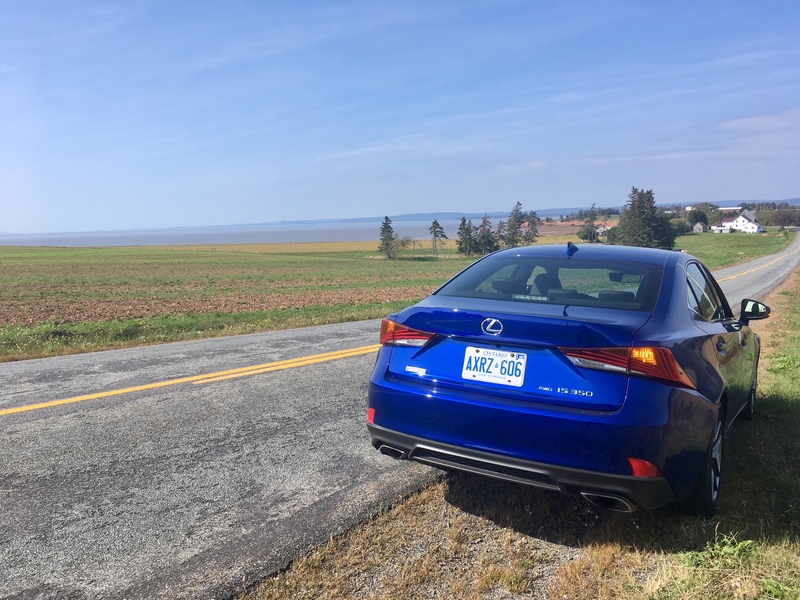 Whether or not it is the new king of the compact sport sedan segment is certainly debatable.